Julia Parish-Morris, PhD, is a scientist in the Center for Autism Research and a faculty member in the Department of Biomedical & Health Informatics at Children's Hospital of Philadelphia. 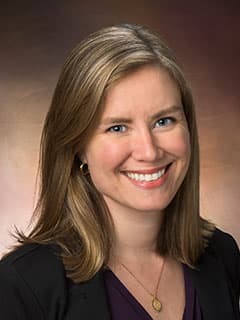 Dr. Morris is a Research Assistant Professor of Psychology with the Perelman School of Medicine and Scientist with the Center for Autism Research at CHOP. Her primary research interests are language development, social attention, and the interactive effects of language and social motivation on higher social cognition (e.g., Theory of Mind). Recent projects include assessing social motivation and language development using infrared eye tracking, studying growth trajectories of receptive and expressive language in preschoolers with autism spectrum disorder (ASD), examining the moderating effects of language on intervention outcomes in 3- to 5-year-olds with ASD, and applying computational linguistics methods to pinpoint a "linguistic signature" of autism. She is the recipient of numerous awards and honors, including a Presidential Fellowship, National Science Foundation Graduate Research Fellowship, Autism Science Foundation Postdoctoral Fellowship, American Psychological Association Dissertation Award, Alavi Dabiri Award, and an Award of Excellence from the Center for Autism Research. Her long-term research goals are to identify the mechanisms that underlie pragmatic language impairment and social communication difficulty in neurodevelopmental disorders across the lifespan, chart relationships between these domains and functional impairment, inform individualized treatments, and contribute to early identification efforts. Dr. Morris is a member of DBHi and CHOP's Department of Child and Adolescent Psychiatry and Behavioral Sciences. She received her BA in Psychology from Smith College and her PhD in Developmental Psychology from Temple University. Dr. Morris was a Penn-PORT Fellow with the University of Pennsylvania and a post-doctoral fellow with the Center for Autism Research. Dr. Parish-Morris' long-term research goals are to identify the mechanisms that underlie pragmatic language impairment and social communication difficulty in neurodevelopmental disorders across the lifespan, chart relationships between these domains and functional impairment, inform individualized treatments, and contribute to early identification efforts. Chevallier, C., Parish-Morris, J., McVey, A., Rump, K., Sasson, N., Herrington, J., & Schultz, R.T. (2015). Measuring social attention and motivation in Autism Spectrum Disorder using eye tracking: Stimulus type matters. Autism Research, e-pub ahead of print. Chevallier*, C., Parish-Morris*, J., Tonge, N., Le, L., Miller, J., & Schultz, R.T. (2014). Susceptibility to the audience effect explains performance gap between children with and without autism in a Theory of Mind task. Journal of Experimental Psychology – General, 143(3), 972-979. *These authors contributed equally. Hassinger-Das, B., Mahajan, N., Metz, R., Ramsook, K.A., Margulis, K., Hirsh-Pasek, K., Golinkoff, R.M., & Parish-Morris, J. (2016, April). Shared book-reading in the digital age: Examining differences in traditional and tablet books. Paper presentation at the annual conference of the American Educational Research Association, Washington, DC, USA. Parish-Morris, J., Fein, D., & Naigles, L. (2015, November). Growth in naturalistic verb use differs by verb category in toddlers with ASD. Boston University Conference on Language Development, Boston, MA, USA. Parish-Morris, J., Yerys, B., Antezana, L., de Marchena, A., Chevallier, C., Sasson, N. & Schultz, R.T. (2015, May). “Scattered attention” in face perception: The case of co-morbid ASD+ADHD. International Meeting for Autism Research, Salt Lake City, UT, USA. Parish-Morris, J., Fein, D., & Naigles, L. (2015, May). Growth trajectories of longitudinal naturalistic verb use in ASD: Verb category matters. Paper presentation at the International Meeting for Autism Research, Salt Lake City, UT, USA. De Polo, L., Parish-Morris, J., McCleery, J., Bateman, L., Thomas, S., Paterson, S.J., Pandey, J., Kostanopoulos, P., Estes, A., Hazlett, H., Botteron, K., Piven, J., Schultz, R.T. & the IBIS Network. (2015, May). Say what? : Toddlers’ vocabulary growth trajectories differ by word features. International Meeting for Autism Research, Salt Lake City, UT, USA. Clements, C.C., Bartley, G.K., DePolo, L., Bateman, L., Morton, H., Parish-Morris, J., Stein, N., & Schultz, R.T. (2015, May). An Online Verbal IQ Test: Development, Validity, and Standardization of an Adaptive Vocabulary Test for Remote Phenotyping of Parents. International Meeting for Autism Research, Salt Lake City, UT, USA. Parish-Morris, J., Fein, D., & Naigles, L. (2015, March). A Fine-grained Analysis of Naturalistic Longitudinal Verb Use. Biennial Conference of the Society for Research in Child Development. Philadelphia, USA. Parish-Morris, J., Chevallier, C., de Marchena, A., & Schultz, R.T. (2015, February). Using Infrared Eye Tracking to Explore the “Face Deficit” in Youths with Autism Spectrum Disorder. CHOP Research Poster Day, Philadelphia, PA, USA. Wenger, T., Parish-Morris, J., Yerys, B., & Schultz, R.T. (2014, June). Medical history predicts phenotypic differences in Autism Spectrum Disorder. Teratology Society 2014 Annual Meeting, Bellevue, WA. Parish-Morris, J., Gilman, C., Fein, D.A., & Naigles, L. (2014, May). A fine-grained analysis of longitudinal language use in toddlers with ASD: The case of GAP verbs. International Meeting for Autism Research, Atlanta, GA, USA. Parish-Morris, J., Chevallier, C., de Marchena, A., & Schultz, R.T. (2014, May). The “face deficit” in visual attention: Parsing heterogeneity in ASD. International Meeting for Autism Research, Atlanta, GA, USA. Chevallier, C., Parish-Morris, J., McVey, A., Puglia, M.H., Rump, K., Herrington, J., Schultz, R.T. (2014, May). Measuring contextualized social attention using eye-tracking: A promising behavioral biomarker of Autism Spectrum Disorders. International Meeting for Autism Research, Atlanta, GA, USA. Thomas, S., Parish-Morris, J., Cannon, E., Woodward, A., & Paterson, S. (2014, May). Goal anticipation in toddlers with ASD and high-risk siblings of children with ASD. International Meeting for Autism Research, Atlanta, GA, USA. McVey, A., Schultz, R.T., Parish-Morris, J., Rump, K., Pandey, J., Chevallier, C. (2014, May). Studying social attention in autism spectrum disorders: Stimulus type matters. International Meeting for Autism Research, Atlanta, GA, USA. Parish-Morris J. Parent-preschooler interaction during electronic and traditional book reading: Similarities, Differences, Challenges, Future Directions. Keynote Address, Digital Literacy for Preschoolers Conference; 2015; Montreal, Canada. Parish-Morris J. Eye tracking and early development in ASD. J&J educational symposium, Center for Autism Research, Children’s Hospital of Philadelphia; 2015; Philadelphia, PA.
Parish-Morris J. The development of language and communication from 0-3. Invited lecture, CHOP Psychiatry Residency Training Program Children’s Hospital of Philadelphia; 2014; Philadelphia, PA.
Parish-Morris J. Vocal production as a quantitative trait. Center for Autism Research Retreat on Quantitative Traits, Children’s Hospital of Philadelphia; 2014; Philadelphia, PA.
Parish-Morris J. From social “input” to social “output”: The moderating effects of language. Invited lecture, University of Connecticut Department of Psychology; 2014; Storrs, CT.